REDUCED *** THIS CAR WAS WELL MAINTAINED IT'S WHOLE LIFE *** 100% BONE STOCK *** WE SOLD THE CAR A MONTH AGO AND CUSTOMER SOLD IT BACK TO US *** CARFAX CERTIFIED *** CLEAN NO ISSUES *** 150 POINT SAFETY & MAINTENANCE INSPECTION*. ALL SERVICED, CARFAXED AND CERTIFIED! ! ! We would like to thank you for considering Road Ready Used Cars for the purchase of your pre-owned vehicle. Come visit us at our all new state of the art facility situated on over four acres. Our service facility and reconditioning center is amongst the best in the state (Check out pictures under the "Dealer Services" section.) We have over 500 Carfax certified, hand picked vehicles to choose from! 36 years of automotive experience! Go to www.roadreadyusedcars.com for the link to Cars.com Dealerrater.com, Facebook, and Google to check out our stellar review rating of 4.8 out of 5 stars. Call one of our product specialists at (203) 826-2089 with any questions, or to schedule a test drive today! 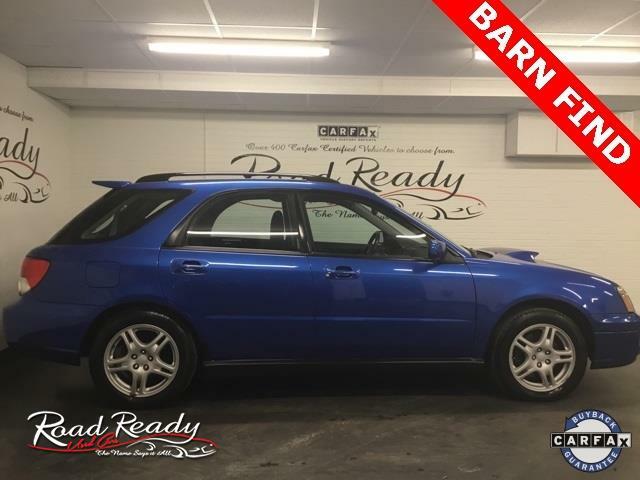 Message: Thought you might be interested in this 2004 Subaru Impreza. Advertised sale price does not include state or local taxes, registration costs, vin etch of $199.00, dealer conveyance fee of $698.00 (not payable to the State of CT), or rustproofing/undercoating of $599.00. Options portrayed in vehicle features may differ from actual equipment due to VIN being decoded. Dealership is not responsible for features a vehicle may not have. Customers must do their due diligence.